Ever wonder where all of these superheroes came from. Has your boy asked you how Green Lantern, Batman, or Spiderman came to be? 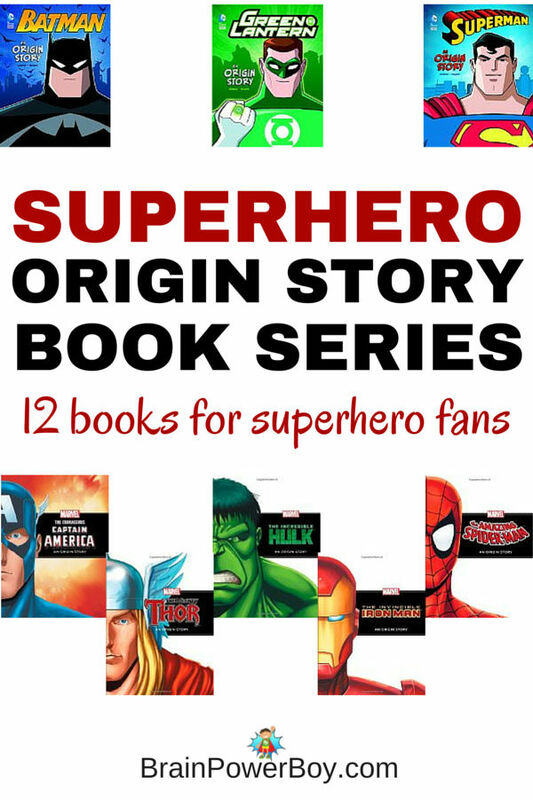 Read all about their stories and that of other superheroes in this superhero origin story book series. There are two sets of series on superheroes. The first is a DC Comics book series and the second is a Marvel Comics book series. The DC Comics series is rather short but it is newer so hopefully they will be adding to it as time goes on. Read the descriptions of the series to get an idea of the content and ages each set is geared toward below. I will be back next week with a new book series for boys list – same bat time, same bat channel. These book series tell the story of the origin of each superhero. If you ever been asked “where did (insert name of favorite superhero here) come from?” These are the books for you. The DC series has four books in the series. Each book is fairly easy to read with large text. The content is fairly tame for a superhero book. They are written for younger readers perhaps 4 – 8 depending on interest level. At the back of the books is a brief bio of the character, a large picture of the superhero with descriptions of his powers, discussions questions and a glossary. The illustrations are very nice. The Marvel Superhero books are a bit more intense and are likely for kids 6 – 9/10. It is the storyline that you have to take a look at. The writing is still fairly simplistic, with short sentences and not a lot of text. For example on one page of the Ironman book it says “Tony to the rescue! He was strong, unstoppable, frightening!” The illustrations are done in appropriate comic style. Thor is taught a lesson and sent to earth by his father to learn to become a real king. The Mighty Thor: An Origin Story . A shy boy who loved science becomes Dr. Bruce Banner who then becomes The Incredible Hulk: An Origin Story . Sickly James Howlette (get it? – howl) needs to learn to take advantage of his mutant powers in Wolverine: An Origin Story . Human and mutant must work together to overcome evil in The Uncanny X-Men: An Origin Story . Super Villains (aliens, beasts, robots) are taking over and Iron Man, The Hulk, Ant-Man, Thor and The Wasp must team up to stop them. The Mighty Avengers: An Origin Story . I hope you and your superhero fan enjoyed this list. If you want more lists like this superhero origin story book series try Pow! Zap! Boom! Superhero Picture Books for Boys. I think I need these books. My kids LOVE the Superheros, but I get them all confused and which character belongs to which storyline! Thanks for sharing with #What to Read Wednesday. We hope you will come back again next week and link-up. I know the feeling! I have mixed up a superpower or two myself lol. Thanks for the linkup. We love books!